Yeah, the new job comes with a little bit of a commute; just long enough to make listening to audiobooks actually feasible. I've listened to a few that have really made the traffic bearable and I'd like to share them with you today. 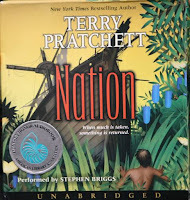 Nation by Terry Pratchett, narrated by Stephen Briggs. With a shiny Printz honor AND a shiny Odyssey honor to its name, Nation definitely deserves a listen. After the wave hits, everything about Mau's life changes. He was in the middle of the task that all boys have to complete to become men, he was heading home when the wave hit. And his entire family was wiped away. The wave changed Daphne's life, too. The ship she was on crash-landed on Mau's island and she was the only survivor. Can Mau and Daphne survive on their own when they don't even speak the same language? Terry Pratchett examines religion, faith, power, family and more in this amusing and touching story. Expert narration by Stephen Briggs really drew me in to the story. Highly recommended. If you haven't yet read this Printz honoree, the audio version is a great way to go. The Gospel A ccording to Larry by Janet Tashjian, read by Jesse Eisenberg. Josh and his best friend (and secret love interest) Beth are obsessed with a mysterious online prophet who calls himself Larry. Little does Beth know that Josh is the mastermind behind the website. When "Larry" explodes in popularity, Josh will find that making a difference in the world isn't as easy as he'd thought. Ohhh, Nerdfighters, take note! This book is right up your alley! Jesse Eisenberg actually sounds a little like John & Hank Green. Josh would totally be a Nerdfighter if he weren't, y'know, fictional. The audiobook isn't perfect - I found it to be a little over-produced - and the prologue and epilogue are narrated by the author. Ms. Tashjian is a wonderful author, but not a gifted reader. I almost gave up right at the very beginning, but I'm so glad I pushed through to the first chapter. Once Jesse Eisenberg started reading, I fell in love! I loved the Nation audiobook, too, Abby. Only problem with audiobooks for me is that I usually don't feel like reviewing them, b/c it's hard to quote. Audiobooks saved my sanity when I commuted, too. I don't commute right now, but I listen to audiobooks when I'm out running errands, or home doing laundry, cooking, etc. I love listening to audiobooks and I'll probably be doing a lot of it when I'm driving to work this fall. Yippee! I love audiobooks! 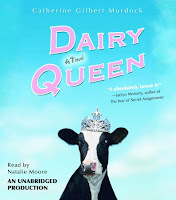 I didn't really like the Dairy Queen audio-I don't know why. I really like anything narrated by Jim Dale (Harry Potter especially). I just started Graceling on audio and it's really good. And I loved the narrator for Dramarama-she's done a lot and I highly recomend anything she's read! It's available for free through Overdrive, through a neighboring library. Glad to hear The Gospel According to Larry is okay once it gets going. I just suggested it and some others to a family, but as I warned them, I don't know the readers... I hope they get past the prologue, too! I LOVE the gspel according to larry!! I also love the website! !